'All About Presentations' by Jazz Factory: PowerPoint Puzzle #2 Answer: How to make your chart interactive? PowerPoint Puzzle #2 Answer: How to make your chart interactive? In my last post I asked a question. I shall repeat it here. Question: Look at this pie chart closely. 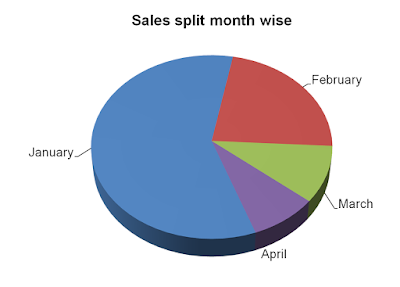 The challenge is to click on the blue slice of the pie and make the January percentage data appear. Then click on the blue part again and make the value disappear. Similarly for Feb, March and April. You don't need to know coding. Can we do it the simple and easy way? There are two ways we can do this. One is my way and the other is Amey's way. Amey, a reader and friend, was able to crack the answer. If you know for sure that you are going to go in that order (Jan, Feb, March and then April), then you can have 9 slides back to back, of the same pie. Odd numbered slides would be the one above, second with this and the Jan figures, 4th with Feb figures, n so on. You don't need 9 slides. Just 5 will do. First slide would be this one. Then for each part of the pie, you can assign a hyperlink, which will take it to diff slides. So once u click on the blue part, there will be a hyperlink, which takes u to the slide which has the figures for the blue part. You can then hyperlink this second slide back to the original one. So click it again, and you return to the original slide. Then click second part and so on. Thanks Amey for this creative answer. Let us now talk about the other method. It is possible to achieve all of this on one slide. We are going to use animation. On clicking over the blue part the value will appear. When you click on the blue part again, the value disappears. The click on the blue part will trigger the animation. Make a chart exactly as shown in the image above. Have the labels Jan, Feb, Mar and April without their values. Step-1 Insert a text box and write 58% in it. 58% is the value of the pie (January). Place the text box near January. We are going to animate this text box. It will appear when we click over the blue part. It will disappear when we click again. Step-2 Draw a shape over the blue part of the pie. Insert shape -> choose scribble. With scribble you can draw any shape. It is like holding a pencil. Draw the shape so that it covers most parts of the blue. Why are we creating this shape? Because we cannot click on the blue part of the pie. The entire pie is one unit. We are going to click on this shape we have created. Step-3 Right click on the shape we have created. Format shape -> Under Fill -> Choose solid Fill and make transparency 99%. Choose Line Color -> No line. Now our shape has become transparent. It exists but no one can see it. We are going to click on this and the audience will think we are clicking on the blue portion. Step-4 Setting up the animation. Click on the text box (58%) -> Under Animations Tab choose Custom Animation -> On your right side pane, choose Add Effect -> Entrance -> Appear. When will this animation happen? What is the trigger? Clicking of the shape is the trigger. Go to Effect Options -> Timing -> Triggers -> Start effect on click of -> Freeform. Now in slideshow mode, when you click on the blue part, the text box appears. Click on the text box again -> Add Effect under Custom Animation -> Exit -> Disappear (you can choose other effects like fade, fly out). We need to set up the trigger. Effect Options -> Timing -> Trigger -> Freeform. Have a look at the presentation which explain these steps along with screen shots. Solution #3 Amey's value addition to my solution shared on Facebook. Remove the labels Jan, Feb, Mar, etc. Have two text boxes. One will say Jan, the other the value (58 in this case). Then its the same as your method. Only difference is put the trigger to the Jan text box. So instead of clicking the blue part, you click the month name and 58% appears there. Slightly simpler than making a free form on the pie. This method really eliminates the need for drawing the freeform shape and saves loads of time. Great input Amey. Thanks.